We’ve considered all the questions we get asked as eye surgeons and filmed ourselves sharing our answers. We hope they help you learn more about laser eye surgery. 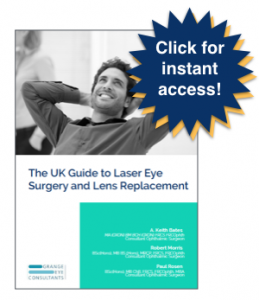 By Grange Eye Consultants|2019-01-03T17:44:23+00:00February 27th, 2019|Categories: Laser Eye Surgery, Presbyopia, Video FAQs|Comments Off on How does presbyopic LASIK laser blended vision work? By Grange Eye Consultants|2016-03-11T10:27:20+00:00September 8th, 2016|Categories: Laser Eye Surgery, Paul Rosen, Video FAQs|Comments Off on What happens if I have an epiretinal membrane? By Grange Eye Consultants|2016-11-04T11:13:24+00:00August 1st, 2016|Categories: Laser Eye Surgery, Refractive Lens Exchange, Robert Morris, Video FAQs|Comments Off on Why should I consider refractive lens exchange? By Grange Eye Consultants|2016-03-10T16:44:14+00:00July 28th, 2016|Categories: Laser Eye Surgery, Robert Morris, Video FAQs|Comments Off on Can laser eye surgery treat my need for reading glasses or bifocals?